Eindhoven is a city in the province North Brabant and is with over 220,000 inhabitants the fifth largest city of the Netherlands. 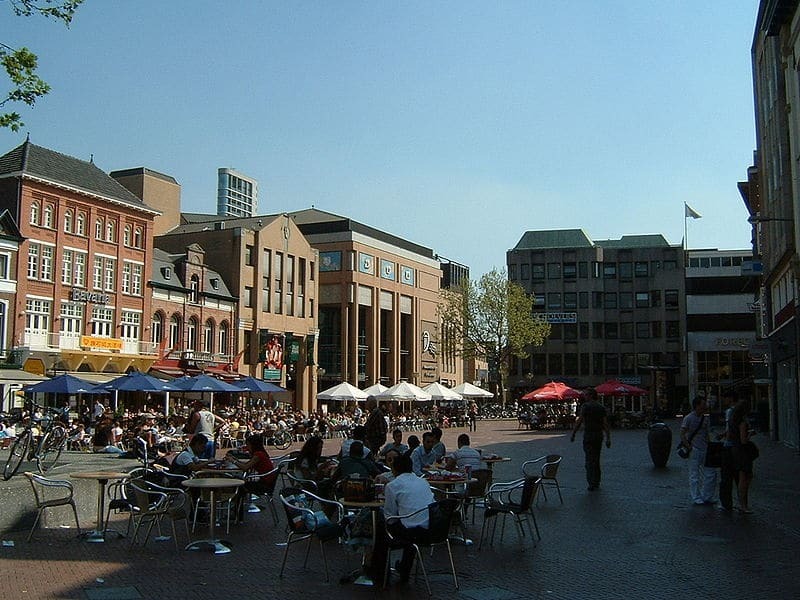 Written records of Eindhoven indicate that the city was officially established in 1232. Duke Hendrik I of Brabant granted city rights to the small town. At the time, the fortified city consisted of roughly 170 houses with a small castle situated outside the city walls. Eindhoven was also given the right to hold a weekly market where farmers from nearby villages could come and sell their produce. A major part of the reason why the city was granted these rights is because it was situated in a prime location along the trade route from Holland to Liege. 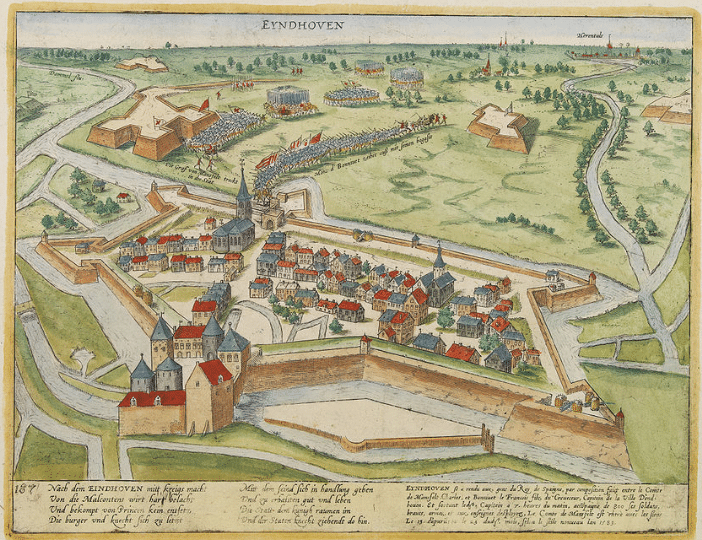 In 1388, Eindhoven’s fortifications were strengthened and a new castle was built inside of the city walls. Unfortunately, soldiers from Guelders plundered and burned the town in 1486. The people of Eindhoven persevered and rebuilt the city, which was completed in 1502. The city included a brand new castle and even stronger fortifications. Yet again, Eindhoven was destroyed in 1543. Its defenses had been neglected because of poverty. In 1554, the citizens of Eindhoven faced a great tragedy when a fire destroyed more than 75% of the city’s homes. With the help of William I of Orange, all of these homes were rebuilt by 1560. Shortly thereafter, Eindhoven faced a number of trials and tribulations. During the Dutch Revolt, there was a battle for control of Eindhoven by the Dutch and the Spanish. Spanish soldiers once again burned down the village and finally captured the city in 1583. Troops proceeded to demolish the city walls. Eventually, the town would go on to be under French control. Many homes were destroyed during this time by invading forces. It was not until 1629 that the city became a part of the Netherlands and it remained a small city until the industrial revolution. The 19th century brought forth tremendous growth for the city. A number of railroads, roadways and canals were built during this time, which made the city more accessible for trade and tourism purposes. Tobacco and textile were the first major industries in the city until the introduction of lighting and electricity. Originally specializing in light bulb manufacturing, Philips established itself in Eindhoven in 1891. The city experienced tremendous growth until World War II. During World War II, the Philips downtown factory became the target of an air raid. More than 100 civilians died as a result. A large part of the city was damaged in September of 1844. Much of the city’s historical buildings were completely destroyed, which is why Eindhoven is the modern city it is today. Today, the city is known as the capital of Dutch industrial design and the local design academy has given birth to many famous designers, including Marcel Wanders and Richard Hutten. Eindhoven is a large city in the Netherlands. It has a good travel infrastructure and is well served by its own airport, as well as excellent transport links to other parts of Holland and Europe. Travelers arriving by air will find that Eindhoven Airport is very well appointed and has all the features expected from a modern airport. There are flights arriving here from many European destinations by low cost carriers, such as Ryanair, Transavia and Wizz Air. The best way to get from the airport to the city centre is by the 400 bus, which takes 20 minutes to get to the city centre. If you are arriving from further afield, you are likely to fly into Amsterdam’s Schipol Airport. There is a train direct from the airport to Eindhoven that leaves every half hour and takes approximately 90 minutes to get to its destination. If you are travelling by train, there are very good connections from all over the Netherlands. From Maarstrichtthe the train takes 1 hour, from Amsterdam it is 1hour 20 minutes, with trains leaving every 15 minutes and from Hertogenbosch only 19 minutes. There are also connections from Rotterdam, Delft, Den Haag, Zaandam and Alkmaar. As you leave the train station it is worth giving it a second look, as from a distance you will see that it is designed to look like a giant Phillips radio of the 1950’s, reflecting the industrial heritage of the city. Eindhoven has a very good bus service and you should have no problem in getting to your destination. As in the rest of the Netherlands, you will need to buy an ov-chipcaart to travel on the buses. These cards can then be loaded up with credit that you use to pay for your journey. Getting around the city by bicycle is a very good and easy option and they are usually cheap to hire for a day. But you should always remember to lock your bike when you leave it. There are many bicycle parks in Eindhoven. two of the most useful are the guarded bicycle parks in the middle of the city at 18 Septemberplein and Heuvegalerie. Although Eindhoven is not the first name that springs to mind for a holiday destination, with its modern industrial history, it is actually a very young and lively city. The fifth largest city in the Netherlands, it has a great cultural heritage and an exciting night life. The Van Abbemuseum is one of the best contemporary art museums around. Displaying works by such artists as, Kandinski, Mondreaan, Appel, Chagall and Picasso, the museum has a collection to rival any of the best modern art museums, anywhere. The Historic Open Air Museum is an open air historical centre that charts local, daily life in and around Eindhoven. It has historical representations of life on a farm around the turn of the first millennium. It also has a reconstruction of an iron age village and a very impressive look into the past of Eindhoven. Phillips First Incandescent Lamp Factory of 1891, is an interesting reference to Endhoven’s past. Which started with their first lamp factory that quickly expanded, taking the city along with it to its current size. Phillips may have moved away now, but it should be remembered that it was almost entirely responsible for the growth of Eindhoven from a small village sized city, to the thriving metropolis of over 200,000 people that it is today. De admirant is a modern tower that is the pinnacle, at 105m, of the “Around the Admirant” shopping centre. The Evoluon was built as a technology museum by Phillips. And the space ship style building remained as that until the 1980’s when it closed. It is now used, primarily, as a centre for conferences. De Heuvelgalerie is a shopping centre where you will find all of the best known brands and clothing stores that you would expect to find in a city the size of Eindhoven. Kruisstraat is a great street for those who like their shopping a little more international. There are many food shops here from all over the world. There is also a large market on Saturdays. Eetcafe Bommel is a great reasonably priced student style cafe that serves soup and a main dish of the day for a low,set price. Cooks is a very friendly restaurant with good food at a reasonable price in comfortable surroundings. Eindhoven is a great place for those that are looking for a holiday that does not rely on historical surroundings. there is plenty to do and many cultural events and festivals.